Every time your group meets is a precious opportunity! This worksheet will help you keep your team stay focused and prepared for maximizing every one of your group's meetings and events. If you want a great group, you need to be intentional about each group meeting. The Group Schedule planner will help your group and your leadership team move forward together. It will help you give ministry away by getting others involved. You can also use it to plan your curriculum choices and to prepare for any special events your group decides to put on. Scroll down to learn more about the worksheet and how it works. A Group Schedule Planner has space to plan for four weekly group meeting, plus any special events. Lesson – Make a note of what conversation you will be using for the Bible study portion of that meeting. You can find individual conversations on many great topics, as well as organized series, as well as many series. 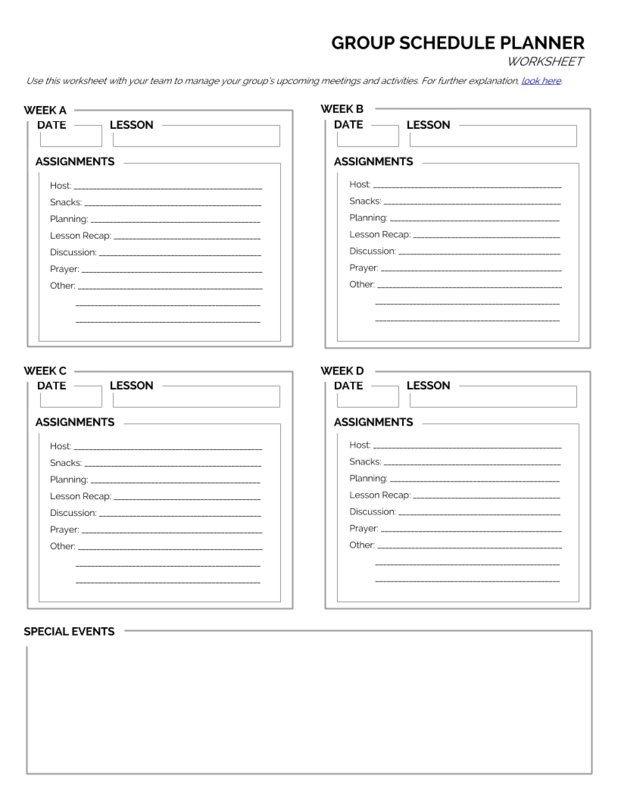 Assignments – This box suggests a number of ways people can get involved in serving the group each week. You may have others, depending on your group. Try to avoid giving anyone more than one assignment. Divide one assignment between two or more people if that helps more people get involved. Use the Team Meeting Planner to keep track of who will be contacting or supervising each of the volunteer assignments. Snacks – Who will bring refreshments? Planning – Who will lead the discussion in the group to plan for the next social or invitational event? Lesson Recap – Who will summarize the lesson for the group? Discussion – Who will lead the group through the discussion questions? Prayer – Who will lead the group’s prayer time, record and distribute prayer requests, etc.? Special Events – As your group creates special fellowship or outreach events, record your plans here. Take note of who will be leading in each aspect of the event. Every time your group meets is a precious opportunity! The Group Schedule Planner will help you keep your team focused and prepared for maximizing every one of your group’s meetings and events. Download the Group Schedule Planner (pdf). If you want a great group, you need to be intentional about each group meeting. How might this worksheet help you to manage your regular group meetings? Explain some reasons why every member of the group should have some responsibility in the group? Discuss the pros and cons of using different people for various duties, versus assigning one person permanently to each role. Why is it important to keep track of group assignments? What are some kinds of special events that a small group might consider planning?